Happy Halloween! It's another Monday Funday at TGF's Farm Fresh Challenge blog and we are, of course, celebrating Halloween! Are you a creeper or too cute to spook? 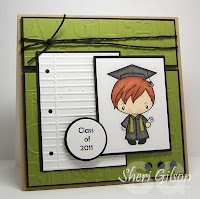 The base of this card is Old Olive with layers of sparkling spider web by Reminisce and Basic Black. The grave yard is made by tearing brown cardstock to look like rough dirt. The tombstones are curved by sliding a piece of cardstock into a curved punch to round the top. The other stone is a cuttlebug die and emboss set. The moon is punched with a circle in Very Vanilla, then embossed with Swiss Dots. The clouds are torn vellum. The gate is punched with Martha Stewarts spooky fence. The sidewalk is drawn in with a gel pen. The image is TGF's Hallo Bride digi colored with copic markers. I also printed it in vellum, coloring some highlights on the back of the vellum, before tearing around the image to give it a ghostly glow. 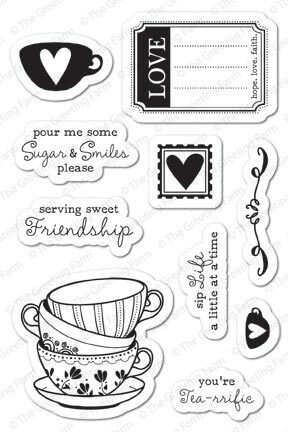 The sentiment is printed using Twilight font, punched with a wide oval, and mounted on the decorative label punch. I added a decorative staples on the corners. It's another Monday Fun-day at TGF Farm Fresh Challenge blog and I am this week's host! Today's assignment....emboss it! Hello again! It's another Friday Spy-day at TGF's Farm Fresh Challenge blog! And, for some extra fun, the Bugaboo crew is playing along with us today! See the FFC DT's Bugaboo creations here, then hop over to the Bugaboo blog and check them out! 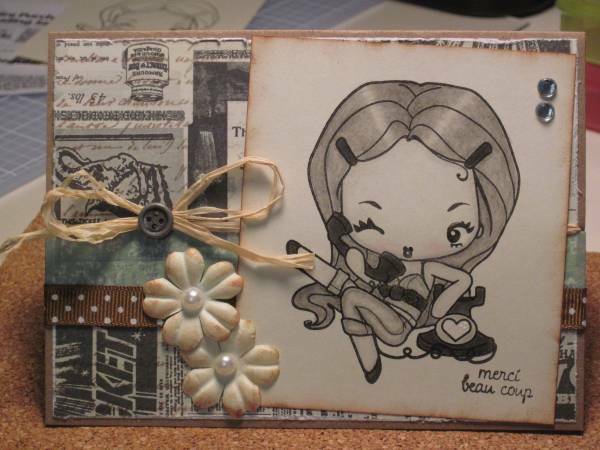 Today's challenge is to CASE this fantastic card by PaperCrafty! The card base is kraft with layers of lilac and basic black. The lilac layer is embossed using the domino cuttlebug folder. (Can you believe I found it on clearance at Hobby Lobby for just $2.38?) I used a white gel pen to add the dots. The upper pieces has Early Espresso baker's twine tied on. Once the lilac layer was mounted on basic black, I used dimensionals to adhere to the kraft base. The blue quote sheet is from the Quotes Smash Pad, mounted on Basic Black. The image is TGF's Wild Sprout Audrey digi, colored in copic markers. She is one of my fav digis because she is such a cheeky tomboy! The two layers are mounted with dimensionals. The sentiment is stamped in Whisper White using Studio g alphabet stamps from Michael's dollar bin, then punched with 1 1/4" circle and mounted on a 1 3/8" basic black circle. The sentiment is mounted to the card with a dimensional. It's another TGF Farm Fresh Monday Funday! 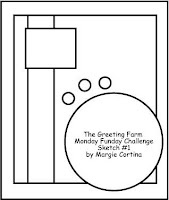 This week's challenge is a sketch by our own team captain, Margie Cortina. Be sure to head to the FFC blog to check out the other team member's awesome work and play along! This month, the TGF Farm Fresh Challenge DT are doing an animal challenge with Bugaboo Stamps! Head on over to Bugaboo to play their animal challenge. It's another Friday Spy-day at TGF's Farm Fresh Challenge blog. Today's challenge is with rapary. You can use her design or take inspiration from elements of her card. October's Retro Fresh Challenge at TGF! Hop on over to TGF's Farm Fresh Challenge blog to play along with this month's Retro Fresh challenge. This is the chance to give some older TGF stamps some extra TLC and rise to this month's challenge...animals! No TGF animal stamps, no problem! Dig out your paper, embellishments, etc. and go crazy! Happy Friday! Today begins our new "Friday Spy-day" challenge at The Greeting Farm's Farm Fresh Challenge blog. This is a CASE of dictionary's card, using TGF's Hallo Shedevil digi, colored in copic markers with accents of red glitter. I am also entering this in Anyone for Anya's Halloween Inspiration challenge. This is for TGF's Monday Funday use scallops challenge. Pop over to the Farm Fresh Challenge blog and play along! TGF October "All Clear" Release & Surprise! This is a long post, so hang with me and I am sure you will be as excited as I am! 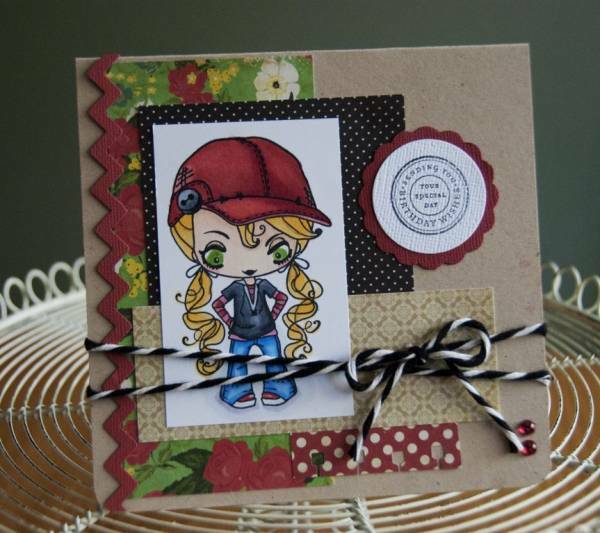 I have been patiently waiting to announce...I am a TGF Farm Fresh Challege Design Team Member! Wooohooo! It has been hard to keep mum, but here are my first new release cards. Check the bottom of the post to find out the other surprise and a chance to meet the rest of the new TGF Design Team! This is the new TGF acylic clear mount set called "Tea-rrific". Head on over to The Greeting Farm site to see all five of the new sets! I am so excited about this set! The first thing that popped into my head was Alice in Wonderland and Mad Tea Party, so that was my first stop! This card is made with Stampin' Up's Very Vanilla with layers of retired Pawsitively Prints designer paper and scrap from DCWV's Tattered Time photo stack. I used my sewing machine to sew the edges, wrapping with Early Espresso baker's twine before mounting to the base. The sentiment is printed on cardstock then punched with the 1 1/4" circle punch and layered with 1 3/8" circle and scalloped circle punches. I used a scrap piece of twine to tie on the button. The images are TGF's Wonderland digis and Tea-rific and colored in copic markers. I used a craft knife to make a slit in the top cup to slide the Mad Hatter in. The tea cups have three layers - top cup is a single layer, middle is two layers, bottom is three. Inside, is some scrap and the white rabbit. The next card is two different designs of the same card I have seen all over the web. The first card opens like a traditional top fold card. The base is vanilla, with layers of sand, chocolate, whisper white and retired Pawsitively Prints from Stampin' Up. The form is easy enough - measure in 1/2" on the open end, then cut diagonal to the top corner. I cut the designer paper just a bit short to show some lip at the top and bottom of the "cup" front. The lid, is cut slightly wider than the card top, corners rounded and a 1/4" score along the bottom for the bump where the lid fits the cup. Right before I attached it to the card front, I used my SWAK that I got from Michael's dollar bin around Valentine's. The cup hugger is a piece of sand colored paper run through a crimper then trimmed to fit the cup. I used chocolate cardstock to punch the decorative label. I stamped my image and overstamped the sentiment, then punched with a wide oval and mounted with dimensionals. I added pearls for some bling. Last, I stamped and punched the heart stamp with a 1" square, sandwiching a scrap of string between two layers and added a Tim Holtz tiny staple. For the gift card holder, I made the opening at the top of the card with the fold at the bottom. I sealed the sides, leaving the top open, and making a chocolate colored insert to attach to the "lid". A gift card can be tacked inside. With my own exciting announcement today comes another HUGE bit of news for TGF! The Greeting Farm is beyond thrilled and honored to have been invited as the newest Member Company at SPLITCOASTSTAMPERS! For those of you NEW to Splitcoaststampers (SCS), it is the single largest online community for stampers and a wonderful place to access tutorials, a vast online gallery, and tons of ways to get involved with their awesome forums dedicated to stamping and much more! As one of only ten Member Companies on SCS, The Greeting Farm now has our VERY OWN FORUM to encourage ALL of our customers, new and old to get out there and chat with us, while we keep you up to date on the latest TGF happenings :) With over 700,000 unique hits a month, we are excited about the potential to meet NEW Farm friends, but we are mostly SO, SO very excited about being able to have a 'home' to chat with you, get to know you better, and post fun and important information ALL in one place! We really look forward to this being a means of getting closer to our stamping community, welcoming new stampers and getting to spend more time with our cherished current customers, as well! If you have ANY questions whatsoever, please contact Jess and she will be happy to answer them! With this announcement also brings GREAT news for Galleria users! While we love our galleria and still plan to keep it open for your use, we will now offer the option to post challenge cards, contest entries, etc. to SCS as well. We will be using the INLINKZ system from now on for ALL challenges. Again, we will still keep the Gallery open, but you now will have the option to upload there, to SPLITCOAST, or your personal blogs. All entries will be counted as LONG as they are posted to our INLINKZ below each challenge post. Splitcoasts offers a WONDERFUL gallery option and we can't WAIT to see your cards there!